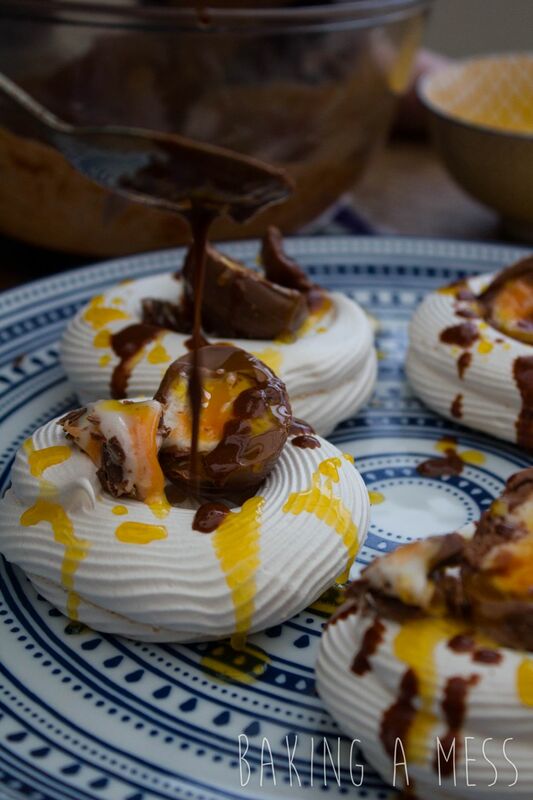 So you all know by now how we feel about creme eggs by now… so when the chocolate gods themselves reached out to us and asked if we wanted to try our hand at their new Easter recipes it was a no-brainer. 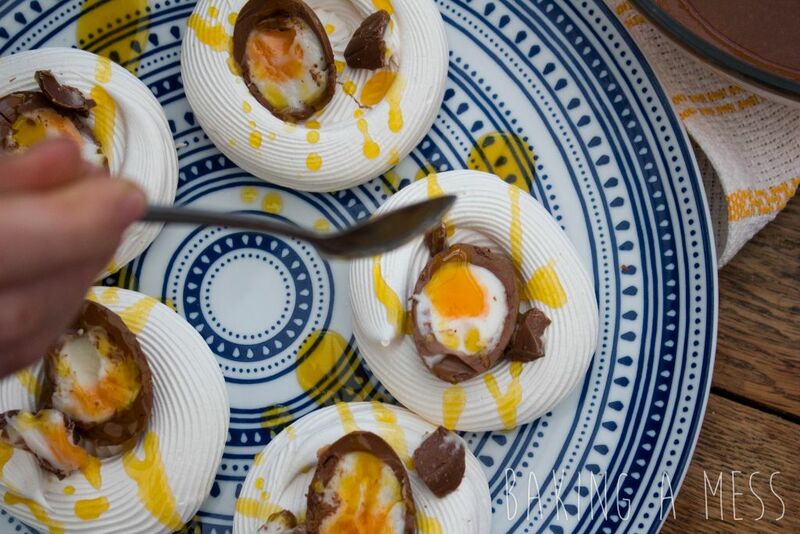 So it turns out that Cadbury have teamed up with Rinkoff, whose creme egg ‘Crodoughs’ have been alllll over our instagram feed, to make 4 yummy creme egg based easter treats! 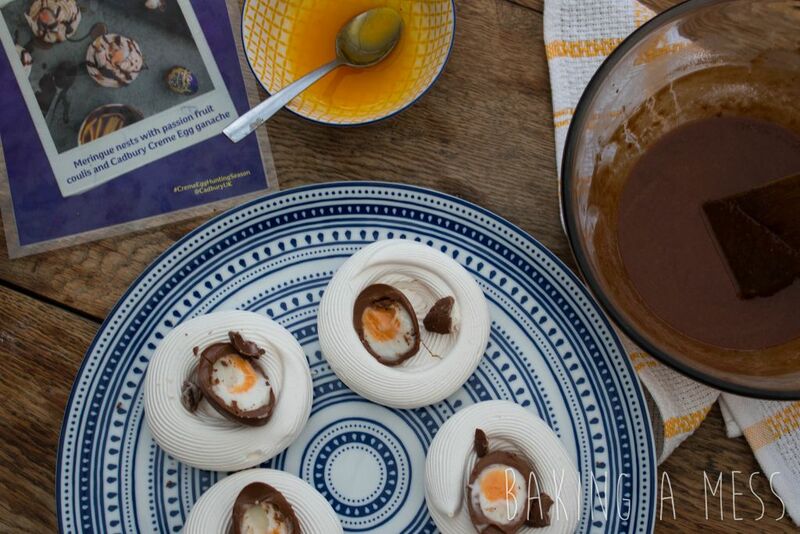 After an eager yes from us to get involved they sent a press packet to the house in a super shiny and iconically Cadbury purple jiffy bag, which was filled with creme eggs, recipe cards and even a creme egg apron (unfortunately only 1 though so we will have to negotiate a joint custody agreement…). Anyway, on with the recipe. 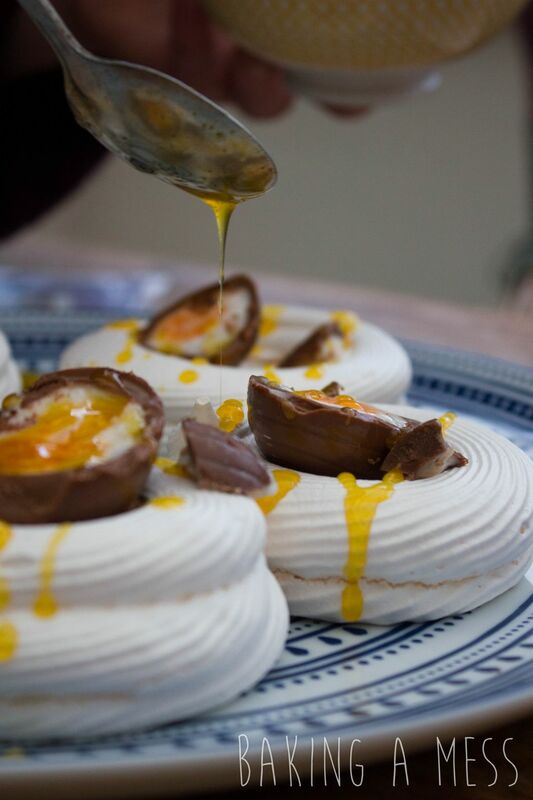 This is a fairly easy one to get started on, a light meringue nest that’s topped with creme egg ganache, a passionfruit coulis and more creme egg just for good measure! 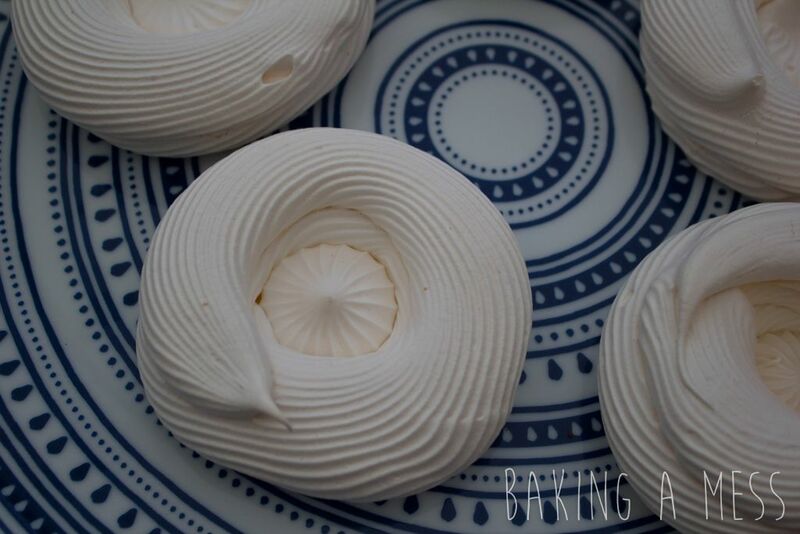 The meringue recipe is a classic one consisting of just egg whites and sugar, we also chose to use our go to trick of putting the caster sugar on a baking a tray to heat it in the oven before adding it to the egg whites as this helps it get extra smooth and glossy! 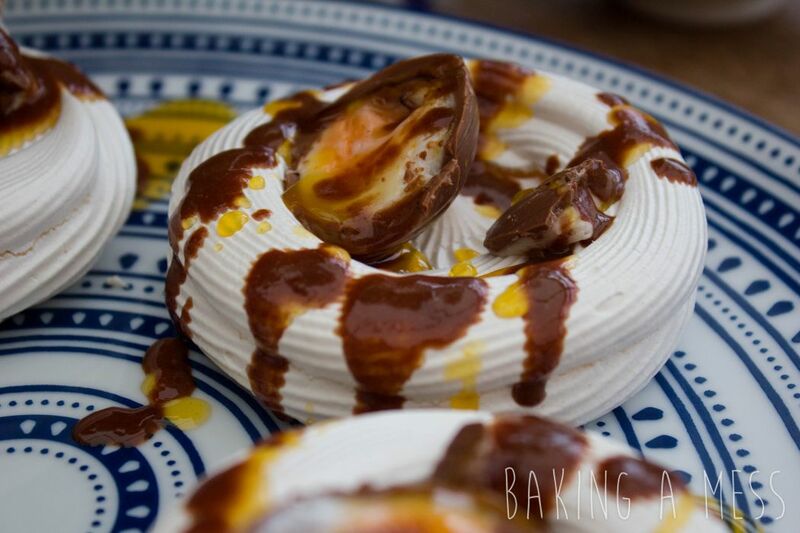 Once the meringues were baked we moved onto the ganache, this one was a little odd to us as typically melted chocolate and sugar leads to crystallisation but with butter instead of cream in this recipe it somehow seemed to work (we’re putting this down to creme egg magic), and also taste pretty great! 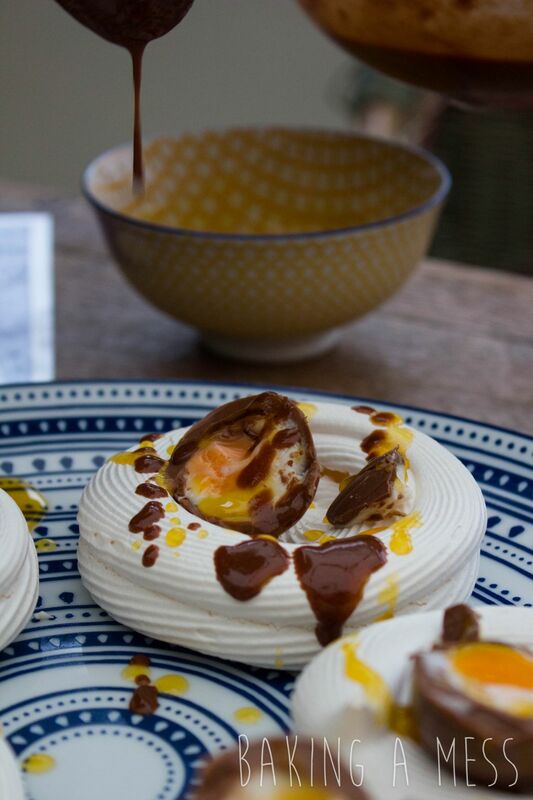 Then for the coulis, nice and easy just passionfruit purée heated with some sugar until you’ve got yourself a gorgeous syrupy bowl of passionfruit goodness. Then just a case of piling it on top of the merigue nests! 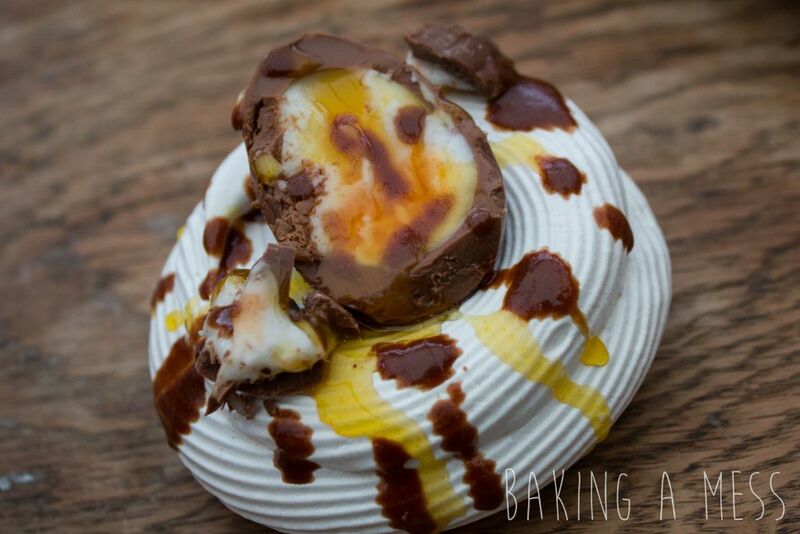 The recipe said to crumble pieces of creme egg over but we chose to top them with a creme egg half so you can see the fondant inside! 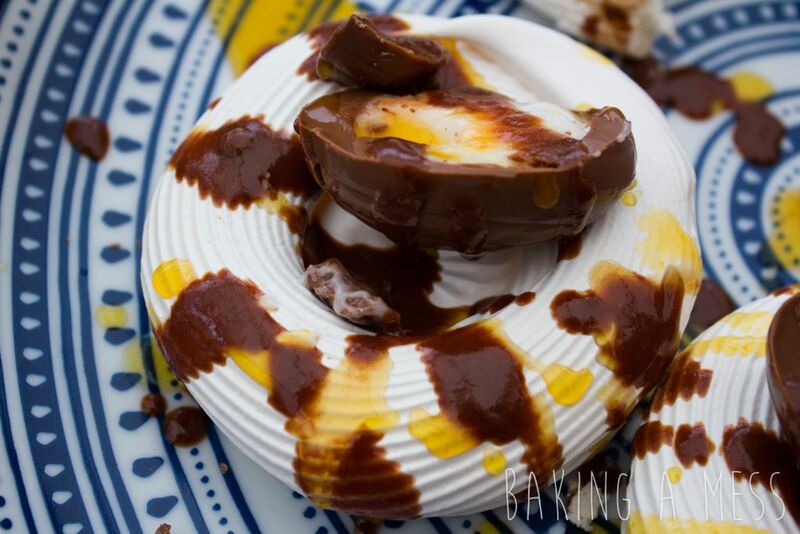 Keep your eyes peeled for some more Cadbury Creme Egg recipes making their way to the blog soon! Oooh yes that sounds dreamy! 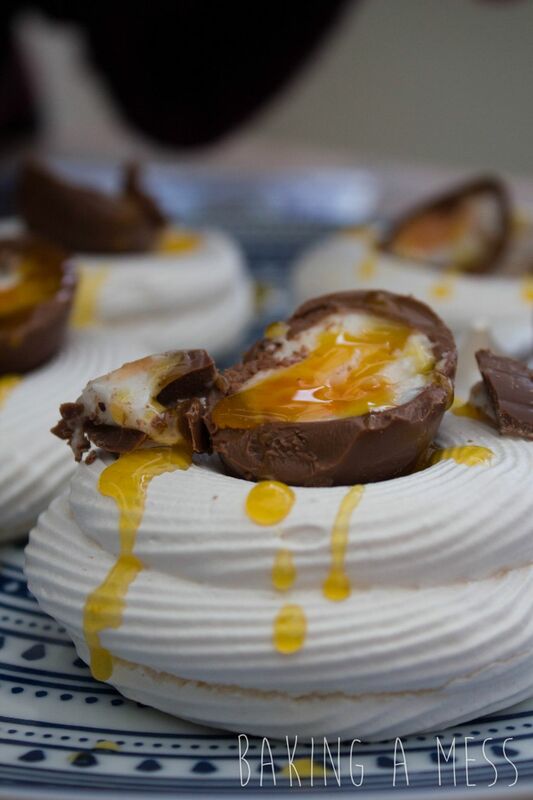 And would mean we’d have no reason not to eat them all year round!! 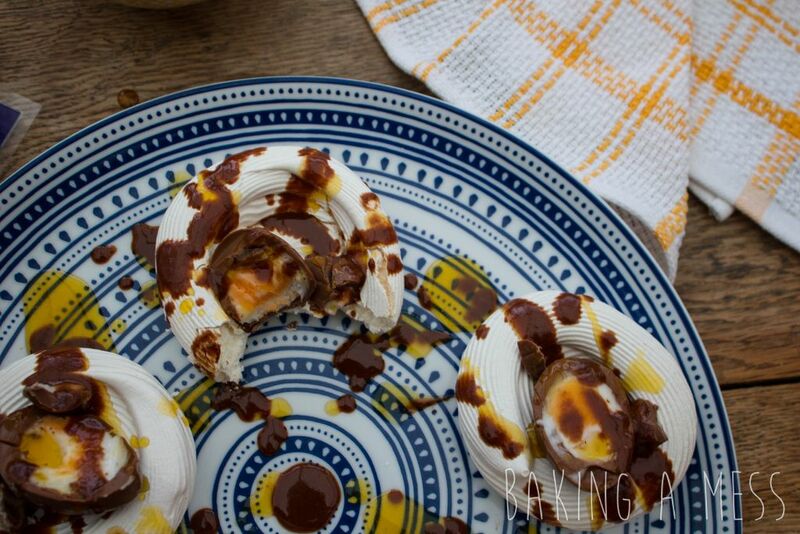 Your meringues & passionfruit- a big yes. 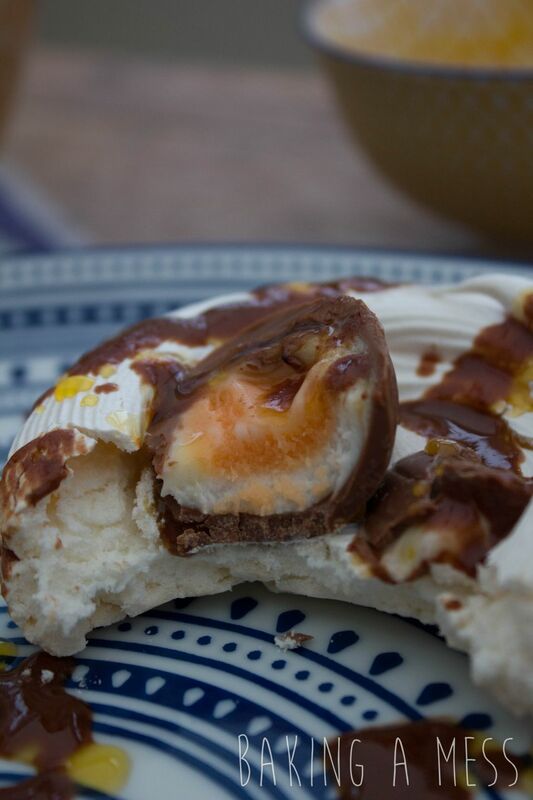 Sorry not so much a fan of the creme eggs tho’ your photos are fab so a great hit for Easter. 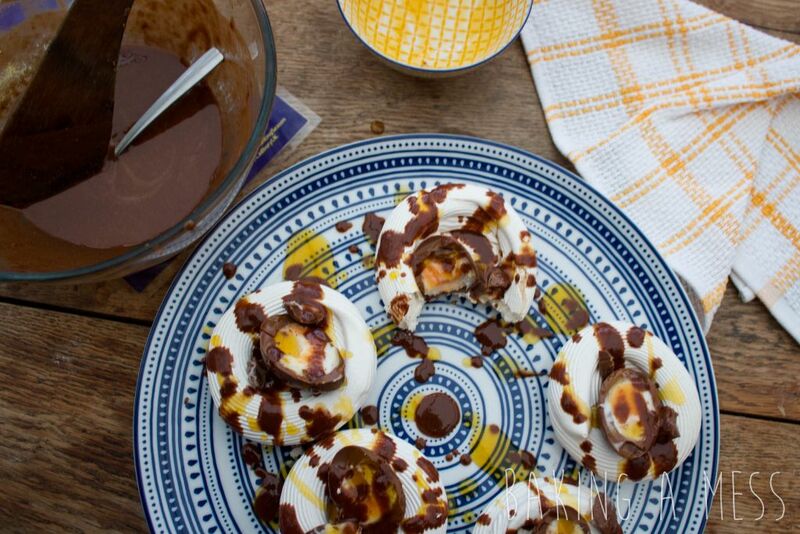 I would substitute for a lovely dark chocolate sauce drizzle instead!